“Our feet were already standing at your gates, Yerushalayim” (Psalm 122:2). Nehemiah chapter 3 outlines the rebuilding of the gates and walls of Jerusalem in the days of Ezra. Its focus is on the names of those who set the gates and rebuilt the walls surrounding each gate. Biblical/Hebrew names have always fascinated me and, in Scripture, they always have prophetic significance. As I began researching the meanings of the names, I found incredible messages. It is important to note that the boundaries of city of Jerusalem in the days of Nehemiah were very different, and much smaller, from modern times. Some gates had different names; other gates didn’t exist or exist now. The layout of the city went south into the City of David or Mount Zion rather than west towards what is known today as the Old City. 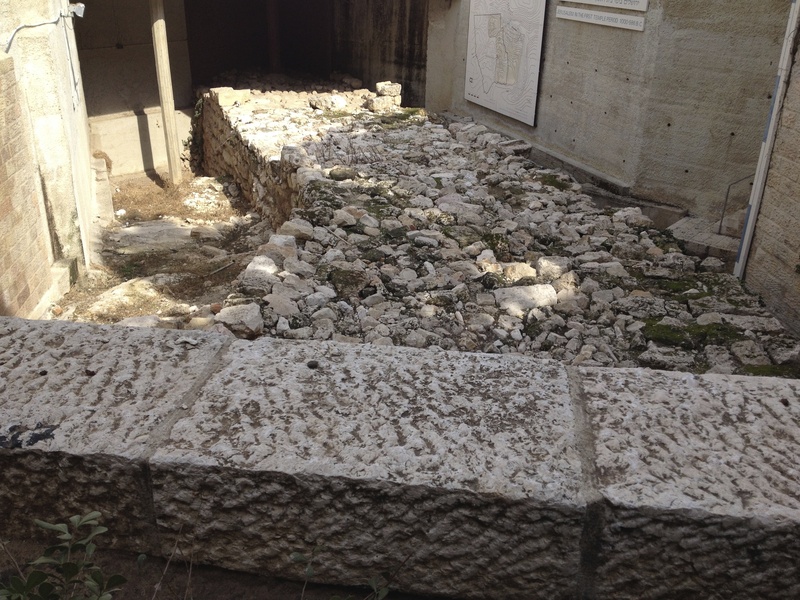 Excavations of the Broad Wall are found near the center of the Jewish Quarter near the Hurva Synagogue. “But the one who goes in through the gate is the sheep’s own shepherd” (John 10:2). Nehemiah 3 begins with the restoration of The Sheep Gate. This gate was where the lambs were brought for examination and eventual sacrifice in the Temple. 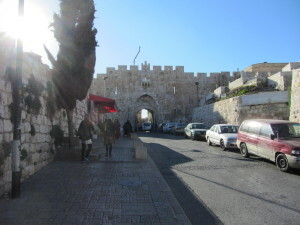 Today, the Sheep Gate is known as the Lion’s Gate and is the entrance to the Arab Quarter near Bethesda. “Eliashib, the high priest along with the Levite priests rebuilt the Sheep Gate to the Tower of the Hundred and onto the Tower of Hanna’el. Next to the priests, the men of Jericho and Zakur, the son of Imri continued building” (Nehemiah 3:1-2). “My God will return with a strong utterance [a shofar blast implying warfare]. The prophetic voice: “The LORD will roar from Tzion and thunder from Jerusalem; the earth and the heavens will tremble. But the LORD will be a refuge for his people, a stronghold for the people of Israel” (Joel 3:16). “So Simon Peter climbed back into the boat and dragged the net ashore. It was full of large fish, 153, but even with so many the net was not torn” (John 21:11). 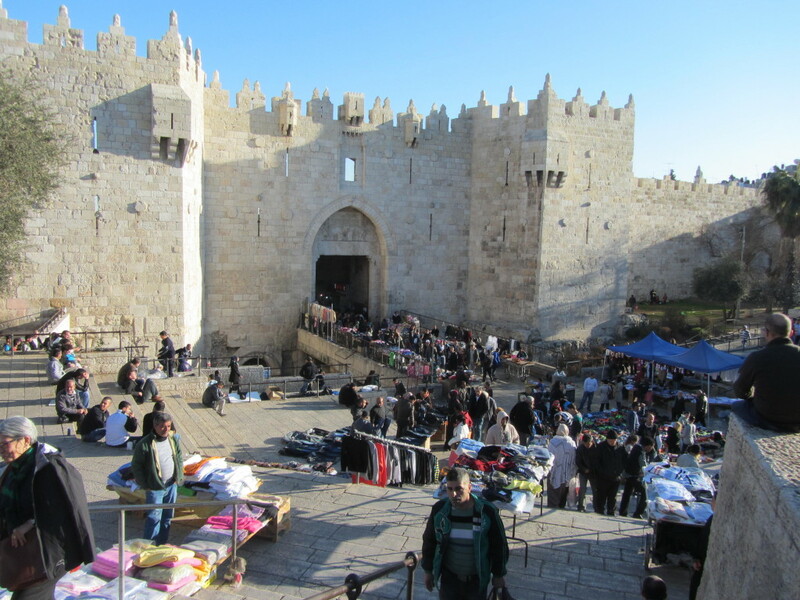 The Fish Gate was the next to be restored in the north wall of ancient Jerusalem near the modern-day Damascus Gate which is also in the Arab Quarter. The Fish Gate was the closest gate to the fish market and fishermen from the Galilee, whether Arab or Israeli, used this gate to bring their fish to market. “The sons of Hasna’ah rebuilt the Fish Gate. Next to them M’remot the son of Uriyah, the son of Hakotz, made repairs. Next to them Meshulam the son of Berekhyah, the son of Mesheizav’el, made repairs. Next to them Tzadok the son of Ba‘ana made repairs. Next to them the men from T’koa made repairs” (Nehemiah 3:3-5). The prophetic voice: “On that day [the day of the LORD],” declares the LORD, “a cry will go up from the Fish Gate, wailing from the New Quarter, and a loud crash from the hills. Wail, you who live in the [fish] market district; all your merchants will be wiped out, all who trade with silver will be destroyed” (Zephaniah 1:10-11). “Yet Saul grew more and more powerful and baffled the Jews living in Damascus by proving that Yeshua is the Messiah” (Acts 9:22). The Old Gate was known as the Sha’ar Yahshana meaning ‘ancient entrance/pathway.’ This ‘ancient’ gate was located on the north side of Jerusalem and may have been what is known today as the Damascus Gate. The Damascus Gate leads out to the Nablus Road and, in ancient days, led directly to Damascus, Syria. “Yoyada the son of Paseach and Meshulam the son of B’sodyah made repairs to the Old City Gate…. Next to them M’latyah the Giv‘oni, Yadon the Meronoti and the men from Giv‘on and Mitzpah made repairs; they worked for the people associated with the governor of the territory beyond the [Euphrates] River. Next to them ‘Uzi’el the son of Harhayah, goldsmiths, made repairs” (Nehemiah 3:6-8). Gibeon or Giv’on was conquered by Joshua just like Jericho. Gibeon means ‘hill country’. Mitzpah means ‘watchtower’ and was a city in Benjamin located near Jerusalem. The word ‘Euphrates’ is an Assyrian word meaning ‘the great stream’. Goldsmiths are mentioned twice in Nehemiah 3 as those who worked on repairing the wall. “The crucible [tests] silver, and the furnace [tests] gold, but the one who tests hearts is the LORD” (Proverbs 17:3). The ways of Yahweh are described by the prophet Jeremiah as ‘ancient paths’ (Jeremiah 6:16). These ‘ancient pathways’ in Jerusalem that so many have walked on over the centuries are accessed through ‘ancient gates’ like the Sha’ar Yahshana. The prophetic voice: “I will break down the gate of Damascus; I will destroy the king who is in the Valley of Aven and the one who holds the scepter in Beth Eden. The people of Aram will go into exile to Kir,” says the Lord” (Amos 1:5). One other job description mentioned in this group of men is a perfume maker who helped repair the way to the Broad Wall. The Broad Wall was a defensive wall about 23 feet thick built during the reign of King Hezekiah. It is believed that the city of Jerusalem at this time was confined to the fortified, narrow hill running to the south of the Temple Mount known as the City of David. There are remnants of this wall in Jerusalem’s Jewish Quarter. “Next to him Hananyah, one of the perfume-makers, made repairs; they renovated Yerushalayim as far as the Broad Wall” (Nehemiah 3:8). “Therefore Jesus no longer moved about publicly among the people of Judea. Instead he withdrew to a region near the wilderness, to a village called Ephraim, where he stayed with his disciples” (John 11:54). “Next to them Refayah the son of Hur … made repairs. Next to him Y’dayah the son of Harumaf made repairs opposite his own house. Next to him Hatush the son of Hashavn’yah made repairs” (Nehemiah 3:10-11). Prophetic voice: “See, I will bring them from the land of the north and gather them from the ends of the earth. Among them will be the blind and the lame, expectant mothers and women in labor; a great throng will return. They will come with weeping; they will pray as I bring them back. I will lead them beside streams of water on a level path where they will not stumble, because I am Israel’s father, and Ephraim is my firstborn son” (Jeremiah 31:8-9). “They [the Levites] were in charge of the bread set out on the table, the special flour for the grain offerings, the thin loaves made without yeast, the baking and the mixing, and all measurements of quantity and size” (1 Chronicles 23:29). The Tower of the Ovens, or in Hebrew tannurim, was located at Bakers’ Street off the western wall of Jerusalem. This area was considered the baking district of Jerusalem. The Sabbath showbread for the Temple was baked here by Levite bakers (1 Chronicles 9:31-32). Zedekiah had his guards feed Jeremiah a daily loaf of bread from Bakers’ Street (Jeremiah 37:21). This is the only place Scripture mentions that women worked on the wall – the daughters of HaLochesh. “Malkiyah the son of Harim and Hashuv the son of Pachat-Mo’av [Sheik of Moab] made repairs on another section and on the Tower of the Ovens. Next to him Shalum the son of HaLochesh … he and his daughters, made repairs” (Nehemiah 3:9-12). Prophetic vision: “Those who walk righteously and speak what is right, who reject gain from extortion and keep their hands from accepting bribes, who stop their ears against plots of murder and shut their eyes against contemplating evil— they are the ones who will dwell on the heights, whose refuge will be the mountain fortress. Their bread will be supplied, and water will not fail them” (Isaiah 33:15-16). “‘Uziyahu [Uziah] built towers in Yerushalayim at the Corner Gate, at the Valley Gate and at the Angle, and fortified them” (2 Chronicles 26:9). The Valley Gate gate was most likely on the southwestern side of the city between the Tower of Ovens and the Dung Gate. It doesn’t exist in modern-day Jerusalem. It was through the Valley Gate that Nehemiah left the city to inspect the wall that had been broken down and the gates which had been burned by fire (Nehemiah 2:13). “Hanun and the people living in Zanoach repaired the Valley Gate … and they rebuilt 1,500 feet of the wall, as far as the Dung Gate” (Nehemiah 3:13). There are several valleys around Jerusalem. The Kidron Valley, the Tyropoeon Valley, and the Hinnom Valley. The Kidron Valley is dotted with thousands of burial sites and is known as ‘the valley of the shadow of death.’ The Tyropoeon Valley, called the ‘valley of cheesemakers’, separates Mount Moriah with the Temple Mount from Mount Tzion also known as the City of David. The Hinnom Valley is on the south and west of Jerusalem. In Hebrew, the Hinnom is gehenna. Scripture calls this place the ‘valley of slaughter’ because of the sacrifices to Molech which took place there (Jeremiah 32:35). It is most likely that the Valley Gate led out to the Hinnom Valley. Prophetic voice: “A voice cries out: “Clear a road through the desert for the LORD! Level a highway in the ‘Aravah for our God! Let every valley be filled in, every mountain and hill lowered, the bumpy places made level and the crags become a plain. Then the glory of the LORD will be revealed; all humankind together will see it, for the mouth of the LORD has spoken” (Isaiah 40:3-5). “The bull for the sin offering and the goat for the sin offering, whose blood was brought in to make atonement in the Holy Place, is to be carried outside the camp; there they are to burn up completely their hides, meat and dung” (Leviticus 16:27). The Dung Gate in Hebrew is Sha’ar Ha’ashpot or “Gate of Garbage”. It received its name from the refuse and ash that was removed from the Temple and taken out out of the city into the Valley of Hinnom where it was burned. The Dung Gate is mentioned in Nehemiah 12:30 when the priests and the Levites dedicated the gates and the wall. There was a ramparts walkway on which the people could walk around the city and offer their praise and worship to Elohim (Nehemiah 12:13). “Malkiyah the son of Rechav, leader of the district of Beit-Hakerem, repaired the Dung Gate … (Nehemiah 3:14). The present-day Dung Gate was built during the Ottoman Empire and is probably not in the same place as it was in Nehemiah’s day. The gate was widened in 1948 to allow cars to enter. In the days of the Temple, it was a gate where refuse was taken; today it is the main gate into the Jewish Quarter where tourists visit the Western Wall and the Temple Mount. ““For my people have committed two evils: they have abandoned me, the fountain of living water, and dug themselves cisterns, broken cisterns, that can hold no water!” (Jeremiah 2:13). The Fountain Gate was on the ophel or the part of the eastern hill that sits between the City of David and the Temple Mount. It was near the Pool of Siloam and was used by the people for a cleansing immersion before proceeding to the Temple. It was at the pool of Siloam that Yeshua told a blind man to go and wash the mud out of his eyes. “Go,” he told him, “wash in the Pool of Siloam” (this word means “Sent”). So the man went and washed, and came home seeing” (John 9:7). “Shalun the son of Kol-Hozeh, leader of the district of Mitzpah, repaired the Fountain Gate; … he also rebuilt the wall of the Pool of Siloam, by the royal garden, as far as the stairs that go down from the City of David. After him Nechemyah the son of Azbuk, leader of half the district of Beit-Tzur, made repairs from the place opposite the tombs of David as far as the artificial pool and the soldiers’ barracks” (Nehemiah 3:15-16). “Prosper, all prophets, the watchtower. Yahweh comforts, sends. Strong devastation, House of Rock. Prophetic voice: “And he [Yeshua] said to me, “It is done! I am the ‘A’ and the ‘Z,’ the Beginning and the End. To anyone who is thirsty I myself will give water free of charge from the Fountain of Life” (Revelation 21:6). “He stationed guards at the gates of the house of the LORD, so that no one who was unclean in any respect could enter” (2 Chronicles 23:19). From the Fountain Gate, a number of priests repaired the wall sections attached to their homes until they reached the Gate of the Guard. It was in this section that Eliashib, the high priest lived. Like the Ephraim Gate, the Gate of the Guard needed no repairs. “After him the Levites made repairs: Rechum the son of Bani; next to him Hashavyah, leader of half the district of Ke‘ilah, made repairs for his district. After him their colleagues, Bavai the son of Henadad … made repairs. Next to him ‘Ezer the son of Yeshua, leader of Mitzpah, made repairs on another section, opposite the ascent to the armory at the Angle. After him Barukh the son of Zakkai worked diligently … to the door of the house of Elyashiv the high priest. After him M’remot the son of Uriyah made repairs on another section, from the door of the house of Elyashiv to the end of the house of Elyashiv. The priests from the plains continued the repairs from the high priest’s house to the Courtyard of the Guard. “Binyamin and Hashuv made repairs opposite their house. After them ‘Azaryah the son of Ma‘aseiyah, the son of ‘Ananyah, made repairs next to his house. After him Binui the son of Henadad repaired another section, from the house of ‘Azaryah to the Angle and to the Corner. Palal the son of Uzai made repairs opposite the Angle and the tower that projects out from the upper part of the royal palace near the Courtyard of the Guard” (Nehemiah 3:17-25). Prophetic voice found in the Millennial Temple of Messiah shown to the prophet Ezekiel: “He [the angel] went to the east gate, climbed its steps and measured one of the gate’s doorposts at ten-and-a-half feet wide and the other one the same. There were guardrooms, each ten-and-a-half feet square; the distance between the guardrooms was eight-and-three-quarters feet” (Ezekiel 40:6-7). “All the people came together as one in the square before the Water Gate. They told Ezra the teacher of the Law to bring out the Book of the Law of Moses, which the Lord had commanded for Israel” (Nehemiah 8:1-3). The Water Gate led down to the Gihon Spring which was located near the Kidron Valley. It was at this gate the people of Israel gathered to hear Ezra read the Torah on the ‘first day of the seventh month’ or the Feast of Trumpets. “Next to him, Pedaiah son of Parosh and the temple servants living on the hill of Ophel made repairs up to a point opposite the Water Gate toward the east and the projecting tower. Next to them, the men of Tekoa repaired another section, from the great projecting tower to the wall of Ophel” (Nehemiah 3:26-27). Prophetic voice from Ezekiel’s vision of the Millennial city of Jerusalem: “He then brought me out through the north gate and led me around the outside to the outer gate facing east, and the water was trickling from the south side” (Ezekiel 47:2). “The whole valley of corpses and ashes, including all the fields as far as Vadi Kidron, and on to the corner of the Horse Gate to the east, will be separated out for Adonai; it will never be uprooted or destroyed again” (Jeremiah 31:39). 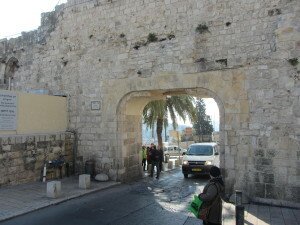 The Horse Gate was close to the king’s stables and the men of Jerusalem would ride their horses out of this gate to war. “Above the Horse Gate the priests made repairs, each one opposite his own house. After them Tzadok the son of Immer made repairs opposite his house” (Nehemiah 3:28-29). The prophetic voice: “Next I saw heaven opened, and there before me was a white horse. Sitting on it was the one called Faithful and True, and it is in righteousness that he passes judgment and goes to battle” (Revelation 19:11). “Kore the son of Yimnah the Levi, gatekeeper at the East Gate, was responsible for the voluntary offerings to God; he had to distribute the offerings made to Adonai and the especially holy gifts” (2 Chronicles 31:14). The East Gate was part of the Eastern Wall and had an entrance directly to the Temple area and courtyards. It is believed that Yeshua used this gate to ride into Jerusalem; however, the actual East Gate is now underground. 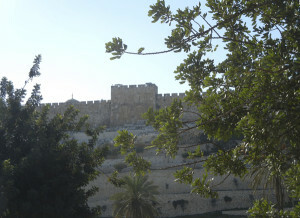 The Eastern or Golden Gate faces the Mount of Olives. It is closed and waiting for the Messiah’s return to Jerusalem and the glory of the LORD to be restored in the Temple. “After him Sh’ma‘yah the son of Sh’khanyah, the keeper of the East Gate, made repairs. After him Hananyah the son of Shelemyah and Hanun the sixth son of Tzalaf made repairs on another section. After him Meshulam the son of Berekhyah made repairs opposite his own room” (Nehemiah 3:29-30). The prophetic voice: “The LORD’s glory entered the house through the gate facing east” (Ezekiel 43:4). “He [King Hezekiah] appointed military commanders over the people, then gathered them before him in the open space at the city gate and spoke these words of encouragement to them: “Be strong! Take courage! Don’t be afraid … we have Adonai our God to help us and fight our battles!” (2 Chronicles 32:608). The Inspection Gate is also called the Muster Gate and is also perhaps the Gate of the Guard. The Hebrew word for this gate is miphkad and means ‘appointed place.’ It was at this gate where King David would inspect his troops before heading into battle. It is most likely the gate where King Hezekiah mustered his military commanders to remind them that the LORD fights Israel’s battles. “After him Malkiyah, one of the goldsmiths, made repairs as far as the house of the temple servants and the merchants, opposite the Mustering Gate and on to the upper room at the corner. Finally, between the upper room at the corner and the Sheep Gate the goldsmiths and merchants made repairs” (Nehemiah 3:31-33). The prophetic voice: “For we must all appear before the Messiah’s court of judgment [an appointed time called Yom Kippur], where everyone will receive the good or bad consequences of what he did while he was in the body” (2 Corinthians 5:10).